Use the zoom controls above to view other Exit locations. Exits on these highway segments are being changed to a mile-marker system - a standard in use throughout the country. The exits on the following highway segments were not numbered previously, but are receiving numbers under this project. Rte. 1/Post Rd. via Gate Rd. RIDOT in Fall 2017 began a highway renumbering program for its Interstate and other limited-access highways. These changes will be phased in over a four-year period. The new exit numbers will be keyed to mile markers - a system used throughout the country for many years that the traveling public has come to expect. 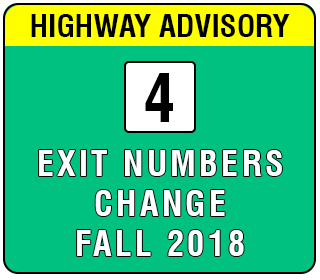 When RIDOT installs new exit number signs, it will install temporary signs indicating the old exit number and will leave them for an extended period of time. Rhode Island and some of its neighboring New England states are among the last to change to this method of numbering its highways, as required by the Federal Highway Administration. The highway numbers in Rhode Island were assigned sequentially. A mile-marker exit number system lets drivers know how far they need to travel to reach their desired off-ramp. They also allow for easier expansion for future interchanges since the entire highway would not have to be renumbered to accommodate a new exit number. RIDOT is developing schedules for new segments of highways. The project also will include I-95 and I-195, as well as Routes 10, 24 and 37.